The week before Thanksgiving the food stores are filled with all the fixings for a scrumptious Thanksgiving meal. You have gotten all you need and have lugged your groceries through the door. Now you look at your recipes, making a strategic plan as to how you will cook everything in order to have the entire meal hot and ready at the same time. It is from this instance that your furry friend can tell that something is up! Animals are highly sensitive and can suffer from stress just as we do. The moment your, and their, routine changes, your pet can sense your anxiety. You rush around, spending the day making your exquisite meal, and then your family and friends start coming to the house to celebrate. And through it all, your pet watches the bustle not knowing what to make of it. The best thing to do is to ensure that your furry friend has a safe haven away from the guests and noise. This gives them a place to retreat to if they become overwhelmed. The other thing to remember is that animals mimic your moods so if you are feeling anxious or stressed they will be susceptible to the same feelings. 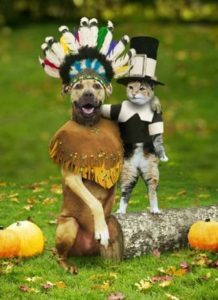 The best thing you can do to ensure a Happy Thanksgiving for both your animals and your guests is to recognize that your pet may need to be segregated from the party in order to relieve the stress from all the excitement. We all have feelings and emotions, including our furry friends. Be mindful and understanding in these times of increased stress and activity.